Bose has been hit by a lawsuit that accuses the company of spying on its wireless headphone customers through its Bose Connect mobile app and violating consumer privacy rights (via Reuters). The complaint was filed on Tuesday in a Chicago federal court by Kyle Zak, who is seeking an injunction to stop Bose's "wholesale disregard" for the privacy of customers who download the app to their smartphones. 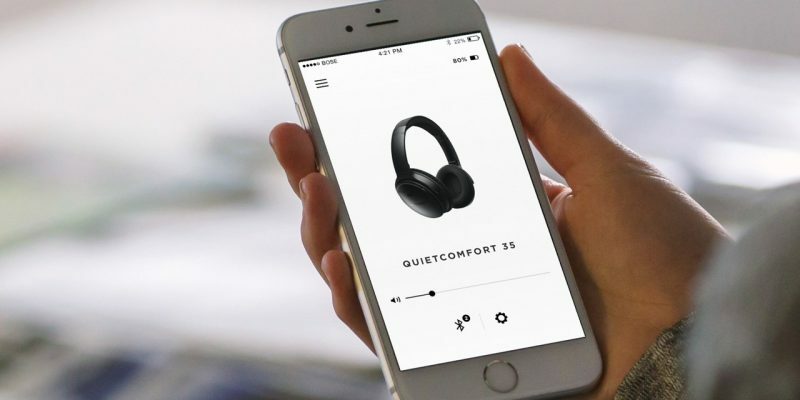 The lawsuit alleges that Bose tracks the listening habits of users when they are wearing headsets like the company's QuietComfort 35 headphones, gleaning information through the app such as music tracks played, podcasts, and other audio listened to. According to Zak, who bought a pair of $350 QC35 cans, Bose sends all available information to third parties such as Segment.io, a data capture outfit whose website promises to "collect all of your customer data and send it anywhere". Audio choices offer "an incredible amount of insight" into customers' personalities, behavior, politics and religious views, the complaint said, citing as an example that a person who listens to Muslim prayers might "very likely" be a Muslim. Zak is seeking millions of dollars of damages for customers who bought Bose headphones and speakers, including QuietComfort 35, QuietControl 30, SoundLink Around-Ear Wireless Headphones II, SoundLink Color II, SoundSport Wireless and SoundSport Pulse Wireless. Zak also wants a halt to the data collection, which he said violates the federal Wiretap Act and Illinois laws against eavesdropping and consumer fraud. Bose has yet to respond to requests for comment on the proposed class action case. Maybe he does, but so what? If you join Facebook you presumably have agreed to their terms. Did Bose's agreement mention this? Do you understand the concept of informed consent? The only way to get companies to pay attention and listen to your complaints is to sue for millions. If this stops companies collecting your usage data and reselling it then it's worth it. I'm confused though. I have the Bose QC35 and use the app. I never had to put my name into the app... All I use it for is listening to songs. How could my information possibly be "sold off"? Is this article implying that my conversations and whatever I'm saying into the microphone get sent to Bose? I read the article, but am just not getting the fuss. Like how can Bose selling off my listening habits possibly affect me? The app has a control screen that shows you the title of whatever you are listening to, along with playback controls. Just like a Bluetooth car stereo can show you the track name and artist, the Bose headphones are relaying this directly to the app. I notice that when I have connected my QC35s to both my iPad and my phone, and play music from my iPad, the track name/artist shows up on the app on my iPhone and I can use the iPhone to control the playback, even the volume on my iPad, as if I had pressed the buttons on the headphones instead. So there is definitely a direct relay of playback information from the headphones to the app, even if the source is a second Bluetooth device. It didn't occur to me that Bose might be reading that list of music and sending it off to gleam a listening profile of its users. I doubt they are actually receiving data from the microphones in the headset, especially because the current Bluetooth profile prevents high quality music playback and the microphone from being used at the same time. The immediate solution is to delete the app. You don't really need it for basic playback operation. The more effective solution is to hold Bose accountable. This should be an opt-in feature, and clearly displayed that your listening history may be sent to third-parties via the app. Technically any wireless headphone that uses an app could do this, and we don't want to set a trend that it's okay to do this in secret. Does this person use Facebook, too? Regardless, I don't think anyone expected Bose to be secretively eavesdropping on someone's listening habits, where as Facebook you consent to their policy. Bose will eventually have to respond to this allegation. Sweet Jesus it's 2017 and people still lob that around? You can not partially agree to consensually share your data? In that case, brace yourselves, because you have to leave planet earth or live in a forest on a faraway uninhabited island. I actually like it when my tech is listening/watching me, it makes me feel less lonely. I wish everything would be able to track me; it would be amazing if Netflix was as smart as Facebook, imagine if it could suggest me some comedies to watch one day because it heard me crying from my laptop's microphone earlier then. IMHO only terrorist will have a problem with that. Umm...No it's not on page 50 of EUA. The user agreement states comment about collecting anonymized data on how the app is used (when, how long, device OS, crashes etc.) by them and 3rd parties. Nowhere does it say identifiable info collected and shared. They discuss collecting phone OS info in a lot of detail, though make no comment about data on music, which is interesting because why wouldn't they slip that in there? I wouldnt have gone looking if it wasn't for the article. I can't remember needing to provide email etc when I set it up. A number of points to make.. Assume any tech you acquire these days is mining data from everything you do. Would Bose declaring they do this in their terms have stopped anyone from buying their products? Lastly, while no single manufacturer can claim to make the best product at every budget level, I've yet to either read a review (unbiased!) that puts Bose at the top of any group test or find that I personally prefer any Bose products to others. I find other manufacturers at cheaper levels sound better to me. So really folks I'm saying test other manufacturers before paying designer label prices for Bose. I'm sure it'll be in his lawsuit but performing network analysis could show data packets going to third party servers. That's where I'd look. Two valid points and one that has nothing to do with the discussion in this thread. We get it, your ATH-MX50s sound better. I’m having a hard time deciding which I like least. Companies mining and selling personal data for profit. Or lawyers. To the point that if you click I accept that you are now their slave does not mean you are now their slave. Just because you click I accept does not mean they can cram whatever they want in there. Pretty sure they will have a good case regarding wiretapping laws. Not sure if you read the article. They can see SN of device (Bose) and match to your credit card or invoice name. Well I don't mind they sell my data, but at least sell me their product then cheaper... Not with the Bose tax and then still serve ads to me (through selling my data to other ad networks) at my own cost. Without telling me. Again, I don't mind that with Google (even thought I don't use them) but at least Google services are mostly free. Bose on the other hand is good but overpriced (imho, disclosure: I own Bose QC35, my favorite headset) for also getting our private data for free.